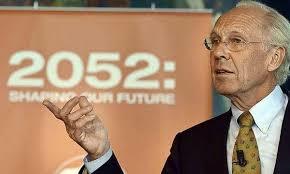 Jorgen Randers presented the Italian version of his book, "2052," in Rome on April 5 2013. What follows is a summary of what he said in that occasion. I apologize in advance for what I may have missed or misinterpreted of Randers' one hour long talk, but I think that this text describes the gist of his speech. 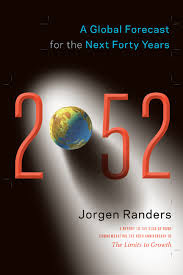 Presenting his book, "2052", Jorgen Randers starts with a bold statement: "I will not tell you what the future could be, but what the future will be". You would think that this shows quite a bit of hubris but, if you follow Randers' reasoning, you'll see that he has a point. Randers is one of the authors of the famous "The Limits to Growth" report to the Club of Rome. Published in 1972, the book caused quite a stir and was widely misinterpreted as a prophecy of doom. It wasn't so and, in his talk, Randers summarizes what he and the others did. They didn't make any prophecy but, rather, they created a 'fan' of 12 different scenarios for the future of the world up to 2100. Some of these scenarios involved decline and collapse of the economy, some involved stabilization and prosperity. Whether one or the other set of scenarios would unfold depended on whether humankind made the right or the wrong choices in dealing with pollution, resource exploitation, and population growth. One problem with the "The Limits to Growth" was that the authors never specified by what mechanisms humankind could develop the consensus necessary to make the right choices, which all involved some sacrifices in the short term. After 40 years of work, Randers has arrived to a conclusion: there are no such mechanisms. The right choices were not made and never will be. 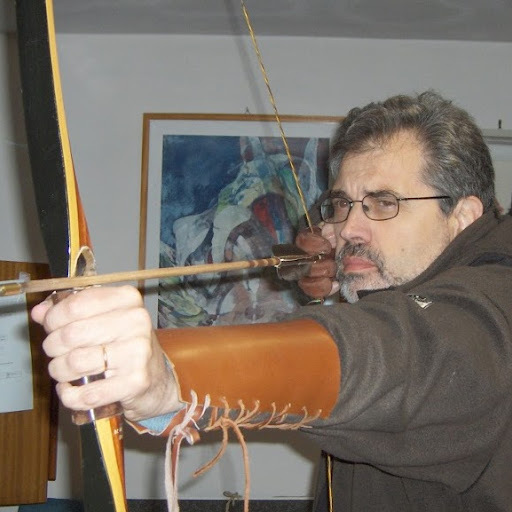 Today, Randers says, there is no more a fan of good and bad scenarios: there is only one; and it is not pleasant. It can only be the decline of our society, constrained by overpopulation, declining resource availability, and widespread damage caused by pollution and climate change. 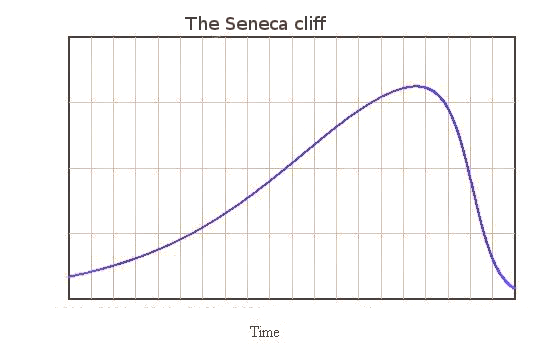 The start of the decline may come earlier or later; collapse may be faster or slower, but the shape of the future is determined. Randers maintains that there is a simple way to describe the reasons that are taking us to this unpleasant future: people always make the choice that involves the least costs in the short term. The problem is all there: as long as we always choose the easiest road, we have no control on where we are going. Imagine you are lost in a forest. Would you think that always choosing the easiest path in front of you could take you home? But this is what we are doing: even though we should know that this is not the way to go where we would like to be. We are unwilling, for instance, to invest in renewable energy as long as fossil fuels are even slightly less expensive and we can neglect their external costs in the form of pollution and climate change. But this choice is based on short term consideration and it will cause us terrible long term damage. Why are we unable to do better? Here, Randers proposes that "short-termism" is deeply ingrained in people's minds and is reflected in our democratic decisional system. He has been accused to be against democracy, but he maintains that he has nothing against democracy: the problem is that democracy is the result of human short-termism. He makes the example of an enlightened politician who decides to introduce a carbon tax. Soon, voters discover that the carbon tax is making gasoline and electricity more expensive. As a consequence, that politician won't be re-elected. It is simple and it happens all the time. Of course, you might object that if the public were to be educated about climate change, then people would accept a carbon tax - actually they would clamor for it. Maybe; but Randers is skeptical. He says that he has spent decades of his life training generations of decision-makers in sustainability and ecosystem science. And he has seen those trained generations taking exactly the same wrong decisions that the previous, untrained, generations were taking. Human nature is difficult to overcome. Randers recounts how he and his colleagues had been discussing about the size of a natural disaster that would wake the public to the reality of ecosystem destruction. Then Hurricane Katrina came and, later on, Sandy. Both where disasters as big as they can be. But they fell flat as wake up calls: the public didn't react. Today, three Americans out of eight still think that global warming is a hoax. Randers has seen the enemy and the enemy is us. I have a problem with the statement "people always make the choice that involves the least costs in the short term". A while back someone did a study with a group of kids: each had a marshmallow placed before them and was told that they would be left alone for 5 minutes. If they hadn't eaten the marshmallow by then, they would get another one. Some did, some didn't. The researchers followed the kids into adulthood and found that the ones who resisted eating the marshmallow were more successful in life. So, yes, anything which requires short-term sacrifice on a mass basis is a non-starter, and the shape of the near future is likely determined. But there still is room for far-sighted individuals to make an important difference for the far future. "...were more successful in life." Haha, doesn't that beg the question? Successful by what measure? Wealth - the ability to consume more and push us closer to planetary collapse? I agree with Jorgen Randers that the only scenario now possible is the "decline of our society, constrained by overpopulation, declining resource availability, and widespread damage caused by pollution and climate change. The start of the decline may come earlier or later; collapse may be faster or slower, but the shape of the future is determined"
The only thing I disagree with him about (though I am not sure if that's what he said or not) is that democracy is by its very nature necessarily short term oriented. Since we have never had real democracy but only "democracy" controlled and run by special political, economic and cultural interests, we cannot know whether a more authentic type of democracy "of the people, by the people and for the people" (as is typically proclaimed) might not have been able to also take the long term interests (of the people) (instead of the special interests) into account and therefore have changed systems and policies as required. But whether that is possible or not is now mostly irrelevant and a mute point given his undoubtedly correct previous statement. It's not very nice to hear it, but it's what I have been thinking for quite some time anyway. So nothing really all that new except that now one of the original authors of LTG has said it publicly. Can we mitigate any of what he says is going to happen at least a little bit, or perhaps postpone the worst of it for a while, remain the only questions. Geoengineering is an insanity and if we ever try it out of desperation, its unexpected (and completely unforeseeable) consequences and dynamics will surely only bring us towards a collapse much sooner. Besides it would only address climate change at the very best. And the rest of the Limits to Growth story and its key variables on both the sources and the sinks side of things, would remain the same in any case. John, don't worry: you are not being censored. It is Google thinking that for some reason your comments are spam. It has happened before, don't you remember that we discussed about that? Now, I've released your comments. Sorry about that, but it is not the result of something I did! Max - there's a lot else to say. For instance, in the heyday of British Forestry during the first half of the second millennium, the harvesting cycle on the well tended oak forests was of over 200 years, in order to provide the massive curves and beams for the great cathedrals. It is simply piffle for Randers to propose that short termism is human nature - his error is to presume that present culture, polluted by the greatest commercial propaganda machine the world has ever seen, is in any way representative of our nature. His statements as reported appear profoundly irresponsible in promoting defeatism and apathy and literally 'discouraging' popular action (discouraging: preventing by lack of confidence of success). Given the contrast with his efforts 40 years ago, I'd suspect that this conduct is a close parallel with that or the author of the Gaia Hypothesis, whose advancing age has also warped his faculties. Your assertions on geo-engineering appear similarly adrift. For a start, there are two primary forms - that can be called Carbon Recovery and Albedo Restoration (CCS & SRM in the officialese jargon). The first is absolutely essential as the means to cleanse the atmosphere of excess CO2, as well as to minimize and advance the peak of CO2 ppm under the essential global Emissions Control. In addition, Carbon Recovery is trebly essential as the sole means to avoid the terminal acidification of the oceans' biodiversity which, in covering 6/7ths of the planet, are the indispensable foundation of terrestrial biodiversity, including us. The only option for Carbon Recovery that can scale to fulfill the task this century and that is potentially largely self-funding, is known as 'Native afforestation for biochar sequestration with co-product methanol'. It will require global co-operation, in particular in agreeing the format of the resulting 'carbon credits' usage - One of the prime North-South obstructions of the climate negotiations can be erased by agreeing that all nations will, by 2100, recover their cumulative carbon emissions and ensure their burial as a soil fertility enhancer. (See biochar & terra preta if the latter prospect is new to you). So how exactly is all my tree planting going to have such terrible unforeseeable consequences ? But then that's the absurdity of this anti-scientific charge - pretend the dangers are unforeseeable and anything from childrens’ vaccination against polio to teaching serfs to read can be dismissed as wantonly reckless. Human beings are not necessarily short-termist, given a certain level of intellect,quite right. In the 18th century, Casanova observed when visiting England, that 'the English only build for the short-term now, 200 years, not like us in Italy'! This was the first era of mass speculative urban development. Taking pride in craftsmanship also fosters a longer-term view of things. But even assuming any sort of geongineering were feasible, that would only address CO2, which is merely a symptom of population overshoot and resource extraction (including but not limited to fossil fuels). It also ignores the global and accelerating trend for forests to be in dieoff from pollution. That can't be stopped unless we stop emitting precursors to ozone, and that would entail a collapse of industrial civilization including industrial agriculture, which would mean billions of dead people. So we're just going to keep burning until the last tree is gone, which will also mean billions of dead people. Gail - both the primary forms of geo-engineeing are demonstrably feasible, though research is urgently needed to develop a safer means of Albedo Restoration than sulphate aerosols. With regard to ozone precursors, which I'd well agree are a fundamental threat, the rapid decline of their output is clearly necessary and fortunately does not entail a collapse of civilization. Two particular routes for that decline are clearly feasible as an outcome of the commensurate global climate treaty. First, under the Emissions Control protocol, ozone is directly responsible for a significant percentage of AGW - and also of course for the poisoning of forest carbon banks, and should thus be targetted as a priority for control measures. Second, the Carbon Recovery protocol will have to accredit the 'native afforestation for biochar' option since it is the only known means that is partly self funding and capable of scaling. In addition, the plowing in of biochar has been shown to substantially reduce soil emissions of NO2, which is of course a prime ozone precursor. The avoidance of the need for artificial fertilizers furthers assists this goal. The only sure fire way of seeing the civilization collapse and the last tree killed by unmitigated warming is to adopt the grandiose defeatism of the likes of Randers, who clearly has no grasp of the strong potential for change within the emerging global politics. To appreciate just why Albedo Restoration is absolutely essential as the third mitigation tactic requires a basic grasp of the realities of the climate emergency we face, so I'll sketch them and hope you'll ask for any clarification if it's needed. The starting point is that cutting emissions doesn't lower global temperature until well after the 100yr residence time of the anthro-CO2 in the atmosphere. In the near to medium term, the six out of seven known mega-feedbacks that are already accelerating are clearly going to provide a combined CO2e output that exceeds the natural carbon sinks intake, after which our emissions cuts are effectively irrelevant as the feedbacks would then be self-reinforcing. There is also the 30 to 40yr timelag on the warming from our GHGs (due to 'ocean thermal inertia'), meaning that the essential Emissions Control, say to near-zero by 2050, would not peak anthro-warming until after 2080. In addition, Hansen & Sato reported how ending fossil fuel usage also ends our fossil sulphate output, which in turn ends our maintenance of the cooling 'sulphate parasol', whose loss would unveil additional warming of 110% (+/-30%) of realized warming. Thus with a successful Emissions Control effort we're looking at heavy continuous warming for at least the next 70 years - which will of course include some feedback warming as well. With GRL reporting in 2010 that cryosphere decline and its albedo loss feedback already impose a warming equivalent to 30% of anthro-CO2 outputs, it seems very clear that the feedbacks would have become independently self-reinforcing long before 2080. Thus in the absence of Albedo Restoration, Emissions Control, with or without Carbon Recovery, offers no solution but only terminal decline. A notable effect of just the present 0.8C of warming and its consequent climate destabilization is its rising impacts on agriculture, with the consequent stresses on geo-political stability. A recent study (led by an IPCC lead author) into the drought prognosis for Asia give some foresight on this: "Food Security: Near future projections of the impact of drought in Asia" can be seen in the reports section at: www.lowcarbonfutures.org. Dr Lawrence Jackson, a co-author of the report, said: "Our work surprised us when we saw that the threat to food security was so imminent; the increased risk of severe droughts is only 10 years away for China and India. These are the world’s largest populations and food producers; and, as such, this poses a real threat to food security." The study was only of Asia, so it is worth noting that according to Munich Re's 40yr global database of rising extreme climate impacts, those impacts are rising far faster in the USA with its formerly huge grain exports than in any comparable area of the planet. In this light, in the absence of Albedo Restoration restoring the pre-industrial global temperature and so stabilizing agriculture, it appears that we should expect the start of serial global crop failures and consequent geopolitical destabilization within 10 to 15 years. And the latter would be the death nell of coherent mitigation efforts. A major driver of the absurd hype against Albedo Restoration is opponents' standard assumption that it would be via sulphate aerosols' injection to the stratosphere. Being thus automatically global, and with a two year residence period, in my view this option should be dismissed from the vital stringently-supervised research program just on the grounds that it cannot be tested at a local scale, and it cannot be swiftly halted if mal-effects appear. There are far more promising options being studied, including 'cloud-brightening' via wind-powered vessels lofting a seawater mist to about 3,000ft, with the advantage that clouds rain out in just 9 days on average. Given say 5 years of intensive scientific study, plus trials, that or some other benign option could make the difference on the critical looming issue of global food security. At present it is our only hope of doing so. However, I would agree that there is a great need of scrupulous research to avoid unforeseen malign consequences to our actions. With regard to over-hasty opposition to the essential geo-engineering mitigation options, the unforeseen malign consequences seem pretty clear if one looks for them - With high volume shrill critique hindering the necessary agreement of a UN scientific supervision agency and suppressing practical research, we are drifting directly towards the position where an emergency decision is made to deploy the only reliable and ready option, namely sulphate aerosols, with their known imposition of droughts being discounted as a minor problem compared with the catastrophic effects of climate destabilization. Thus strident opposition to scientific research of the best options is maximizing the probability that the worst option will be deployed. Finally I must say that if I've sounded harsh in this post it's nothing personal - I've worked on the issue of climate since Carter's time, and the casualties and losses already occurring among desperately poor peoples grieve me a lot sometimes. Such deliberate refusal to acknowledge science of human population dynamics is a woefully inadequate, cowardly response by experts everywhere. Neither science nor humanity is served by the conscious collusion among scientists with appropriate expertise to remain silent. By so doing, silence prevails over science and the world we believe we are protecting and preserving is being ravaged and destroyed. FORMAT: cancer as a metaphor for uncontrolled growth? Meadows: Yeah. Healthy cells at a certain point stop growing. Cancer cells proliferate until they kill the organism. Population or economic growth behave exactly the same. There are only two ways to reduce the growth of humanity: reduction in the birth rate or increase the death rate. Which would you prefer? FORMAT: No one wants to have to decide. Meadows: I don’t either. We have lost the opportunity of choice anyway. Our planet will do it. "three Americans out of eight" ? I'm afraid it might be more than that. In my view Cassadralegacy's abstract of Randers' "2052" misses some points. Randers doesn't say we're lost. It's rather an apology, with the usual Hope-Optimism-Technology punch line, needed for such books to be marketed and sponsored by the BAU people. He's saying "We're lost" and correctly pointing at some developments, such as biodiversity. But he's grossly incorrect regarding the time frame (urgency) and such issues as population growth and women, resource depletion, climate change, fossil fuels, renewables, economic growth, overshoot, urbanisation, and others. In essence he places the downturn [I would say collapse] into a period that is safely after his death, deluding himself by thinking he won't see the collapse. For me Randers is a classic escapist: "We messed it up completely - but I'll still be fine as long as I live." I came to the same conclusion as Helmut. Jørgen is a techno-optimist, plus he has a very restrictive sense of "we" and when he says "democracy" he means "Western representative democracy," not the real thing. It's all about remaining WEIRD ("White, Educated, Intelligent, Rich, and Democratic") for as long as possible, whereas surviving what's coming will be up to those who have been suppressed and marginalized and, at best, made to feel inadequate and want nothing of this WEIRD world except to see it fail and to be left alone in the meantime. The human predicament may well be one for which humankind collectively bears responsibility, but each one of us has to engage in an intellectually honest and morally courageous way in the global conversation offered here. The work at hand for "the collective" has got to be done by individuals speaking out, but also by people working within organizations and institutions so that instrumentalities of governance adopt sustainable practices. Because there is so much to be done, we have no time to waste. Ideas are good but actions are what matter now. We need action not only at the individual level, but also at the local, state, national and international level. This necessary work is impeded because many too many responsible people have chosen willful blindness and elective mutism regarding “the human predicament” confronting all of us rather than electing to speak out about what could somehow be true, according to the lights and scientific knowledge they possess. What is happening now here is not being sensibly acknowledged and reasonably addressed by virtually all organizations, including the predominant environmental organizations. The limits of the natural world and the necessity for human behavioral changes toward sustainable lifestyles and right-sized corporate enterprises are everywhere passively ignored and actively denied. Business-as-usual activities that are marked by seemingly endless economic and population growth…at all levels… are extolled as virtuous. Consequently, human institutions cannot be changed and the global challenges before "the collective" cannot be overcome. People in large numbers must begin to speak out regarding what they see. Most are not doing so. I have become scared of people who cannot see what is obvious as well as frightened of people who do see what is happening and yet consciously and deliberately refuse to speak out about what is occurring on our watch. Truly, this is the great tragedy of our time. ‘The brightest and best’, the silent ones and the vociferous deniers, the ones with unshared knowledge of the human-driven aspects of the global predicament looming ominously before us, are failing science, the children, humanity and all that exists.